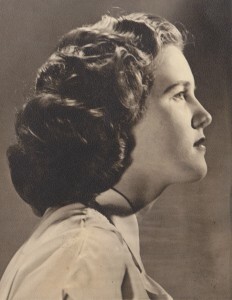 Joan Whitty, St. Mary of the Annunciation School graduation photo, circa 1951. When my mother was diagnosed with ALS in 2009, our family had the first of many discussions about her end-of-life plans. Never one to shy away from difficult topics, Mom expressed her wishes with characteristic cheerful directness. She wanted everything done with the least fuss and greatest economy. The one decision that gave her pause was the photo to accompany her obituary. She didn’t want to be remembered as she looked in the late stages of ALS, but she also felt it would be “phony” to run a photo of herself in young adulthood, before marriage and motherhood. And from this question came a series of conversations between myself and my mother that I carry with me as my own appearance changes along with my sense of who I am. In the course of a life, which image defines who you are? Was my mother the round-faced farmgirl, the fashionable Catholic school graduate, the happy young mother, or the navy-blue pantsuited Mom who, in my mind, hadn’t altered in appearance since 1972? At each stage of my own life, I’ve looked in the mirror and thought, “this is my face. 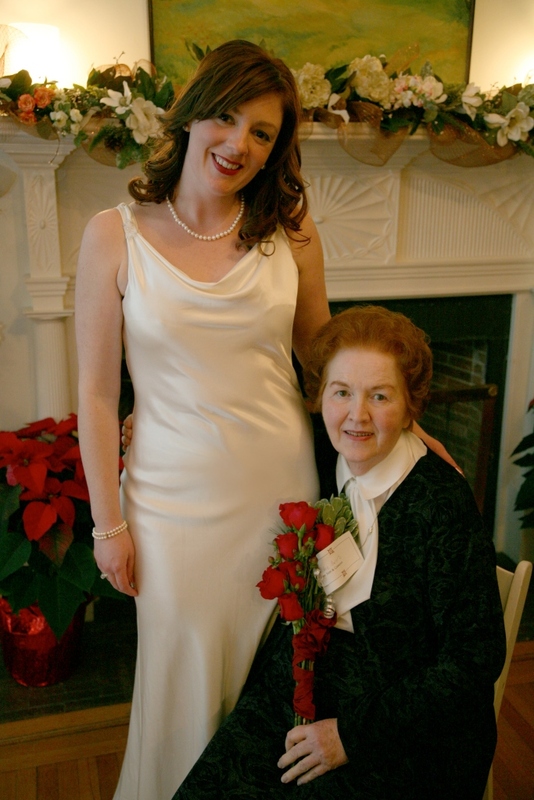 That other face was the old me.” At what point does that evolution of self-image stop, and the thought takes over that “this old face isn’t me!” For my mother, it happened when she became ill.
Jean Powers with Joan Powers at Jean’s wedding, 2007. In the course of my mother’s 76 years, she appeared in perhaps fifty photos – most from her later years. At her funeral our family displayed a collage of our favorites: a 1934 baby photo; with her young siblings; her wedding to our father; holding her babies and, later, grandchildren; visiting family in Prince Edward Island; and at her home on Cape Cod. Friends and family gathered around the collage, remarking on how well it represented Mom and her life. With the advent of digital photography, we now have thousands of photos and videos of ourselves, from the very first to the very last moments of our lives. Will this overabundance of images make it easier for our descendants to know and understand us, or more difficult? With each moment frozen in time and given equal importance on social media, how will our descendants know which events stood out and made us who we were? As was the case with many of her life decisions, frugality determined Mom’s choice for her obituary. On finding that inclusion of a photo involved an additional fee, she insisted we not submit one. And so she is memorialized not by an image at all, but in the sentences crafted lovingly by her family after her death about her accomplishments, intelligence, warmth, and wit – the qualities that enabled us to look past her age and infirmity and see, right to the end, that beautiful, ageless redhead with sparkling hazel eyes. To see photos mentioned in this article, visit Jean’s Facebook page. Beautiful words for a beautiful woman and life. Jean, I feel gratitude for your sharing of your lovely mother’s journey with us. Jean’s oldest brother John was my best friend all through high school, and what I remember most about Joan was she had amazing, beautiful skin! I can see her now, smiling with those Irish eyes. Hi, David! I’m John’s youngest sister. It’s so nice to hear from you. And you’re right, mom had the MOST amazing skin, right to the end. Not a single wrinkle. If she was vain about anything, it was her skin. And rightly so. How lovely that you and your mother could have this conversation, and that you used a collage at her memorial service. I love the one of her high school graduation. My mother is 100, and told me several years ago that she does not want a photo with her obit. This tells me that she does indeed want an obit, and I hope I can convince my siblings to respect her wishes and not to use a picture with it. We do have many good ones, my favorite recent one being perhaps 6-7 years old. She liked that studio picture enough that she gave copies to each of us for Christmas. At the other end of her life is another studio shot taken in 1918 when she was three, in a very blond dutch bob, eyelet dress, white stockings and black mary janes. She was holding her mother’s coin purse and had a big grin, because that coin purse was normally off-limits. She remembers the event, even now. Pictures of family members mean a lot. 100 years old! Wow! Thank you for sharing your story, Doris. Your mother sounds like a great lady. I’m sure whatever choice you make for her obituary will be the right one for your family. I would love to see the 1918 photo! How can I best get a copy of that 1918 picture to you? Hi, Doris! You can email it to me at jpowers@nehgs.org. Thank you! In our area, some people have two photos, then and now. Most commonly these are a high school graduation photo or a military service photo, and then a more recent one, perhaps from a 50th wedding anniversary portrait, or the wedding of a family member.